Pre-Accident Investigations: Better Questions - An Applied Approach to Operational Learning challenges safety and reliability professionals to get better answers by asking better questions. 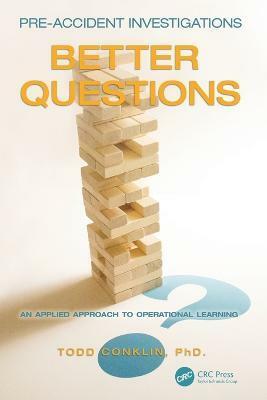 A provocative examination of human performance and safety management, the book delivers a thought-provoking discourse about how we work, and defines a new approach to operational learning. This is not a book about traditional safety. This is a book about creating "real" safety in your organization. In order to predict incidents before they happen, an organization should first understand how their processes can result in failure. Instead of managing the outcomes, they must learn to manage and understand the processes used to create them. Ideal for use in safety, human performance, psychology, cognitive and decision making, systems engineering, and risk assessment areas, this book equips the safety professional with the tools, steps, and models of success needed to create long-term value and change from safety programs. I Hate, "You Can't Fix Stupid!" Why We Do Not Learn? Quick fix versus fix quickly! What is a Learning Team? Who should learn for your organization? Does the team need a leader and/or coach? So, what do we do if we cannot use a timeline? Constantly search for "extent of conditions"
"In his forward to the book, Professor Sidney Dekker says that questions such as "What rule was broken?" or "What should the consequences be?" are no longer good questions because they are short-sighted and elicit short-sighted answers. Ask better questions and you get the kind of answers that will actually help show the way forward. In this he echoes the aims of this thoroughly entertaining and thought provoking book." Todd Conklin retired as a senior advisor at Los Alamos National Laboratory, New Mexico, one of the world's foremost research and development laboratories, in the human performance and safety integration program. Dr. Conklin had worked on the program at Los Alamos National Laboratory for the past dozen years of his 25-year career. Conklin holds a PhD in organizational behavior and communication from the University of New Mexico. He speaks all over the world to executives, groups, and work teams who are interested in better understanding the relationships between the workers in the field and the organization's systems, processes, and programs.